I bought a digital copy of “Lost Cat” on Amazon recently (written by Caroline Paul and illustrated by her partner Wendy MacNaughton). It tells the story of Tibby, Caroline’s elderly cat, who disappeared for several weeks and returned healthier and happier then before. The book centers on how Caroline—with the help of Wendy—tries to uncover the mystery behind his disappearance, where he’d been, who he’s been with, and why. Ultimately, I think it talks about love and relationships and how we are with the object of our affections, whether it’s feline or human. 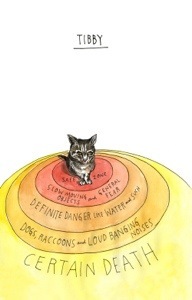 At one point, Wendy made an illustration of Tibby’s world and his fears: the cat was in the middle of 5 concentric circles, the smallest being his safe zone, then the next was occupied by “general fear” or slow moving objects, then “definite danger” like water and such, followed by dogs, raccoons, and loud banging noises, then finally the biggest circle represented “certain death”. When I really think about it, Tibby’s hierarchy of fears is not so different from mine. After putting my iPad down, I wanted to see how I could move beyond my concentric circles and conquer my fear of “certain death.” It made his life so much better in the end, why don’t I do the same and go off on my adventure, too? You can learn more about the book and its creators here.